- Primary Growth: Cells of apical meristems divide, differentiate and develop to form primary tissues. As a result the plant grows in length. This is called primary growth. - Secondary Growth: By the activity of secondary lateral meristems, increase in the circumference/girth of the plant organs due to the formation of secondary tissues in stelar & extra stelar regions, is called as secondary growth. - Normally secondary growth takes place in roots and stem of dicotyledons & gymnosperms. - Due to lack of cambium in monocotyledons, secondary growth is absent. But exceptionally secondary, growth takes place in some monocotyledons. Such as - Palm, Yucca, Dracaena, Smilax, Agave, Coconut etc. Secondary growth in stelar region begins earlier than the extra stelar region. A cambium which is present inside the vascular bundle is called intra fascicular cambium. This is a type of primary meristem. First of all the cells of medullary rays become meristamatic to form inter fascicular cambium which is secondary lateral meristem. Intrafascicular and interfascicular cambium are collectively known as vascular cambium. Vascular cambium is formed in the form of a complete ring which is made up of single layer of cells. In diocot stern some part of V.C is primary and some part is secondary. Two types of cells are found in the ring of this vascular cambium. Fusiform initials are long with pointed ends, while ray initials are spherical(oval). Amount of fusiform initials is more in vascular cambium. Continuous periclinal divisions or tangential division takes place in fusiform initials. The plane of division in periclinal divisions is parallel to longitudinal axis of a cell. 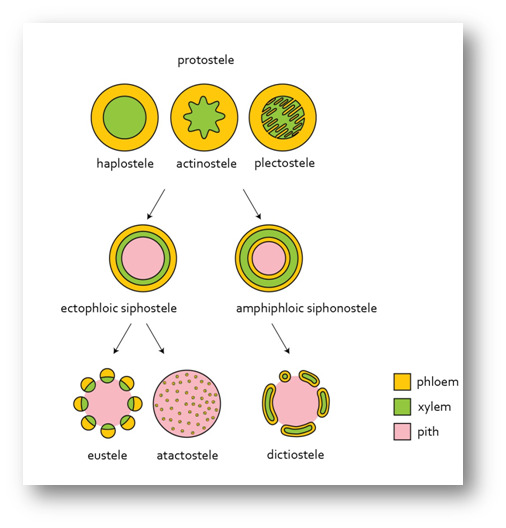 Through this type of activity few cells are formed towards the radius (periphery) and these cells differentiate into secondary phloem or bast and some of the cells are formed towards the central axis and these cells are differentiated into secondary xylem or wood. Normally more secondary xylem is formed as compared to secondary phloem due to unequal distribution of hormones. (Secondary xylem is formed 8-10 times more as compared to sec. phloem). By the pressure of secondary phloem; primary phloem is pushed towards the outside and gets crushed. By the pressure of secondary xylem, ail the primary tissues- such as primary xylem, pith etc and old secondary xylem degenerates in the centre of the stem. Due to this central part of the stern becomes woody. These activities keeps going on continuously in plants throughout. Secondary xylem forms in the plant regularly and primary tissues degenerate continuously. This new secondary xylem also degenerate the old secondary xylem. Waste materials are formed in the stern such as lignin, suberin, tannin, resin-gums etc. due to degeneration of the cells. All these waste materials are filled in the lumen (cavity) of tracheids and vessels of secondary xylem. Because of this, wood in the central region of the stem becomes dark coloured (Black brown). It is called heart wood or Duramen. The peripheral or outer wood which looks light in colour is known as Sap wood or Alburnum. As a result of growing of secondary xylem, the diameter of heart wood increases ­Physiologically active wood is sapwood. The main function of sapwood is water conduction. Heart wood provides maximum mechanical strength to stem. Cavities of tracheids and vessels are progressively filled by waste materials. The bladder like in growth of parenchyma cells which enter the lumen of vessels (mainly) & tracheids through the pits in their wall. Such bladder like in growth are called as tyloses. Tyloses blocks the conduction of water. In gymnosperms tylosoids are formed in place of tyloses. If the heart wood is destroyed in any stem, then there will be no effect on plants (any vital function is not effected), but if the sap wood is destroyed, then the plant will die because conduction of water will be blocked. Heart wood provides stiffness to the stem. The waste materials of heart wood are antiseptic in nature. Heart wood is resistant to bacteria and fungus. Heart wood has a power of repelling insects-So it is resistant to the termites and in rainy season it does not imbibe water. Thus it is the best quality of wood. Study of wood is known as Xylotomy. If a wood is exposed freely in air then decomposition of sap wood takes place rapidly. Position of youngest layer of secondary phloem is just outside the vascular cambium. Position of oldest layer of secondary phloem is just inside the primary phloem. Position of youngest layer of secondary xylem is just inside the vascular cambium. Position of oldest layer of secondary xylem is just outside the primary xylem. If xylem is blocked then shoot will die first. 1. Manoxylic wood: Such type of wood contains more living parenchyma. It is soft and loose wood eg. Cycas and other gymnosperm. 2. Pycnoxylic wood: Such wood contains less amount of living parenchyma. It is hard wood. Such type of wood are found in most of the plants. Example: Pinus (Chir), Mango, Acacia (Babool), Tectona (Sagwan), Dalbergia (Shisham). 1 Apotracheal: In this type of wood parenchyma is in scattered form. 2. Paratracheal wood: In this wood parenchyma is arranged or distributed in the form of masses or groups. 3. Syntracheal wood: In this wood parenchyma is collected around the vessels. 1. Non-porous soft wood: Vessels are absent in such type of wood. 2. Porous wood: Vessels are present in such type of wood. On the basis of arrangement of vessels porous wood is divided into two groups. (I) Ring porous wood: Vessels, are arranged in the form of a ringing this type of wood. Such wood conducts water more efficiently. (II) Diffused porous wood: Asystematical distribution of vessels is found ill this type of wood. Example: In tropical region. Ex. Azadirachta. Non-porous wood also called as homoxylous wood and porous wood also called as heteroxylous wood. Activity of Ray initial: Periclinal divisions also going on continuously in ray initials of vascular cambium. Some of the cells are formed towards inside and some of the cells are formed towards outside through these divisions. All these cells are made up of parenchyma. Radial lines of cells of parenchyma are formed in the stern. These are called vascular rays or Sec. medullary rays. Medullary rays are primary and vascular rays are secondary. Both of them conduct water and food' in radial direction. Order of development of vascular rays is in both centripetal and centrifugal manner. The activity of cambium does not remain same; it is changeable in the whole year. Activity of vascular cambium is affected by physiological and environmental factors. In winter or autumn season the activity of the cambium is less and the secondary xylem or wood formed is not extensive through the vascular cambium. Cells formed during this period are small thick walled and have narrow lumens. This is called autumn wood or late wood. The vascular cambium is highly active in spring or summer season and secondary xylem formed during this period is extensive and cells of secondary xylem are larger, thin walled and have wider lumen. This wood is known as spring wood or early wood. The spring wood is lighter in colour and exhibits low density where as the autumn (or winter) wood is darker and has 'higher density. 1. The autumn and spring wood are formed in the form of rings. 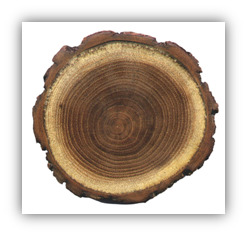 The ring of any type of wood is called growth ring. Thus two growth rings are formed in one year. 2. A ring of autumn wood and a ring of spring wood are collectively/known as annual ring. Thus are annual ring consists of two growth rings. The number of annual rings, formed in a tree gives the idea of the age of the tree. The study of determination of age of the plant by these techniques is called Dendrochronology. 3 The annual rings are counted from the base of the stem because basal part has maximum annual rings and upper part has less. Therefore, counting from the basal region can give the correct idea. 4. A piece is taken from the stem up to central region from the base of stem with the help of increment borer instrument. The annual rings are counted from that piece and again inserted (fitted) into the same stem at the same place. 5. More distinct annual rings are formed in that regions where climatic variations are sharp. 6. More distinct annual rings are formed in temperate plants. 7. Distinct annual rings are not formed in tropical plants. Distinct annual rings are not formed in India except Himalayan regions. 8. Least distinct annual rings are formed in seashore regions because the climate remains same throughout the year. 10. In deserts annual rings are less distinct. 11. Annual rings are bands of secondary xylem and xylem rays. 12. Sometimes drought conditions prevail during the middle of a growing season resulting in formation of more than one annual ring. These are called pseudo annual rings. Secondary growth takes place in extra stelar region due to the activity of cork cambium. Cork cambium is also known as Phellogen or Extra stelar cambium. (The cells of the cork cambium are rectangular). Cork cambium arises from the hypodermis or from the outer layer of cortex because they become meristematic. Cork cambium is also formed in the form of a single layered ring. It forms sec. tissue in cortical region. Cork cambium also divides periclinally. It forms some cells towards the outside (epidermis) and some cells towards the inside (cortex). Those cells formed towards outside, their middle lamella is suberized. Due to this, these cells become dead. These cells are known as Cork or Phellem, Those cell formed towards the inside are differentiated into parenchyma and may contain chloroplasts. These are called secondary cortex or Phelloderm. Cork is formed in high quantity and secondary cortex is in less quantity because activity of cork, cambium is more towards outside. The highest activity of cork cambium is in winter (autumn) season. Ring of cork cambium remains living only for one year. Each year, a new cambium is formed below the previous cambium. This new cambium is derived from the secondary cortex or phelloderm. These places are known as Lenticels. Lenticels appears on the outer surface of the plant either in small points or in the form of areas of protuberance. Lenticels are made up uf scattered group of living cells. Usually they are formed below the stomata. These cells' are known as complementary cells/complementary tissue. The main function of lenticels is exchange of gases between plant and atmosphere. Rows (vertical or longitudinal) of lenticels may occur opposite the medullary rays, facilitating the free exchange of gases. Transpiration also takes place through the lenticles 15 known as Lenticular transpiration. Adventitious roots on cutting originates from the living cells of lenticels in vegetative reproduction. Lenticels are found in most of the woody trees but absent is  woody climbers. Lenticels are mainly found on wood stems and they are never found on leaves. Lenticels are present all over the plant body They are also present on fruits. If lenticels are blocked then root will die first due to lack of food. All the tissues which Occur outside the cod cambium are collectively termed as rhytidome Rhytidome includes cork and tissues which become dead due to the pressure of cork. Lenticels: Most of the cells of phellem are dead. But at some places living cells are also found. Suberin is not deposited in these places. There are two views about the bark. 1. Old view: All the tissues situated outside the cork cambium is called bark. According to old view bark includes only dead tissues. 2. Modem view: All the tissues situated outside the vascular cambium is called Bark. According to modern view bark includes both living and dead tissues. Bark has two parts. Outer layer of bark is called Rhytidome and inner layer of bark is secondary phloem. 1.Ring Bark: Continuous bark of equal thickening is called ring bark. It is formed around the stem in the form of a complete ring. In ring bark cork cambium is continuous. Example: Bhojpatra (Betula) - A complete distinct ring bark is formed in this plant. Its bark was used as a writing material as a paper in ancient period. Ring bark is also formed in eucaiyptus. 2. Scaly Bark: Discontiuous bark of unequal thickening is called scaly bark. This bark is formed around the stem in the form of pieces or fragments. In scaly bark the ring of cork cambium is not continuous. Highly obvious scaly bark is formed in Psidium guajava. Except this scaly bark is also formed in Neem (Azadirachta), Mango (Mangifera indica) and Tamarindus etc plants. 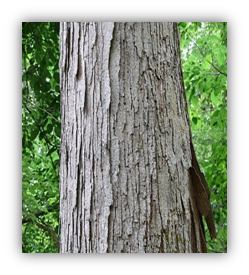 Mostly, scaly bark is found in plants. If complete bark of tree is removed then paint become dead due to excessive water loss. If bark is removed in the form of ring at the base of main stem then root will die first due to lack of food. First of all, conjunctive tissue becomes meristematic during the secondary growth in a dicotyledon root and form separate curved strips of vasular cambium below phloem bundles. Then after, the cells of pericycle lying opposite to protoxylem also becomes meristematic to form additional strips of cambium. In this way a complete ring of vascular cambium is formed. The portion of vascular cambium formed by pericycle is less. The main: portion of vascular cambium is formed by conjunctive tissue. The shape of ring of vascular cambium is wavy in the beginning, but later on it becomes circular due to the pressure of secondary xylem. The portion of vascular cambium formed by conjunctive tissue becomes meristematic first and form the secondary xyelm towards the centre. Ultimately the ring becomes circular by the pressure of secondary xylem (Pushing outwards). The activity of vascular cambium of root is the same as the activity of vascular cambium of stem. Secondary xylem is formed towards the inner side and secondary phloem is formed towards the outer side-by vascular cambium. 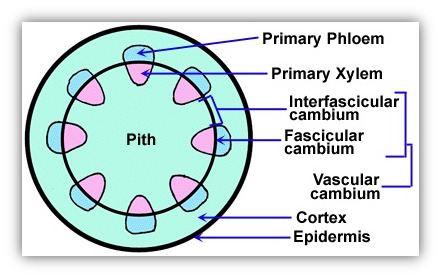 The portion of vascular cambium which is formed by pericycle is responsible for the formation of pith rays. These are made up of parenchyma. These pith rays are known as primary medullary rays (Multiseriate). 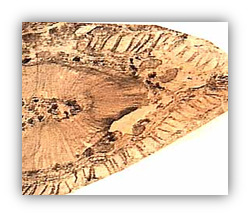 A few medullary or pith rays are also formed from remaining vascular cambium. These are called secondary medullary rays (uniseriate). Thus two types of medullary rays are found in the secondary structure of roots. The presence of two types of medullary rays is basic characteristic feature of roots. Only secondary medullary rays are found in stem after the secondary growth. Both of them conduct water and food in radial direction. Cork cambium is developed from the pericycle in roots. Cork is formed towards the outside and secondary cortex is formed towards the inner side by the cork cambium. Lenticels are also found in roots but less in number as compared to stem. Cortex completely degenerate in roots after the secondary growth of one or two years. This falls down due to the pressure of cork, whereas in stem, it degenerates after the long duration. Secondary growth is essential in roots to provide strength to the growing aerial parts of the plants and fulfill the requirement of water and minerals. Annual rings are not formed in roots because these are not affected by the changes of environment. Secondary growth is not found in monocot roots. 1. Healing of wounds: When any plant part gets injured wound is formed there. Boundary of the wound is raised outside and composed of similar type of living cells (parenchyma) called callus. Living cells of wound are responsible to form a cambium. This is called wound cambium. It is also called inducible cambium. This newly formed cambium forms cork towards the outside. This cork covers the wound entirely. Wound cambium is a secondary lateral meristem. 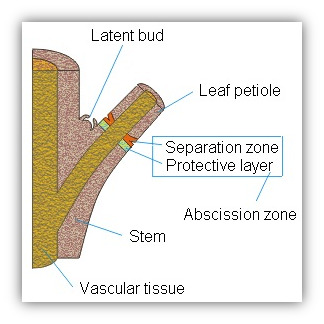 Abscission takes place due to formation of abscission layer at the base of plant organ and it is composed of parenchyma. ABA induces the formation of abscission layer. Middle lamella is dissolved in abscission layer during abscission and primary walls also dissolve partially or completely. Sign of leaf fall on stern is called leaf scar. It is a type of wound. The living cells of leaf scar are responsible to form cork cambium, which produce cork. Cork covers the wound. At the site of abscission protective layer is found which is suberized. 3. Knots: Knot is formed when branches are embedded inside the main stern. 4. Grafting: Grafting is not possible in monocots because cambium is absent there. Normally vascular cambium is circular, but it is folded in stern of some plants. Later on these folds break and separate from each other. Each fold is responsible to form a complete vascular bundle. Many vascular bundles are formed in stern. Generally xylem and phloem is formed from the maximum part of the vascular cambium and medullary rays are formed from the few parts of vascular cambium. But in some plants parenchyma (Medullary rays) is formed from the maximum part of the vascular cambium and rarely in some places xylem and phloem are formed. Example: Aristolochia, Vitis vinijera (Grape). In some of the plants, a new ring of vascular cambium is formed each year. This is formed outside the previous ring. Example: Mirabilis, Boerhaavia, Bougainvillea etc. Vascular cambium is formed from the pericycle in plants of Amaranthaceae and Chinopodiaceae family. A complete ring of vascular cambium is formed from the pericycle. 5. Interxylary Cork: A cork layer that develops between the two growth rings of secondary xylem is called interxylary cork. Cork cambium originates from the epidermis in some of the plants. Example: Malus pumila, Solanum dulcamara, Ouercus suber (oak). Cork is derived from the pericycle in some plants. In some members of plants such as Dracaena, yucca, Agave, Aloe arboresence, Lomandra, Kingia, Sanseviera, etc, vascular cambium is formed from the outer region of the ground tissues. Parenchyma formed towards the outside by the vascular cambium and secondary vascular bundles are formed toward the inner side. In some plants, the girth of the stern increases without cambium, such as-Palm, Musa. Tulipa etc. The apical meristem of these plants is of special type. This is known as primary thickening meristem. This apical meristem is responsible for the growth in both length and girth (thickness) of the plant. Gymnosperm stem: In Cycas and Gnetum successive ring of vascular cambium is found. 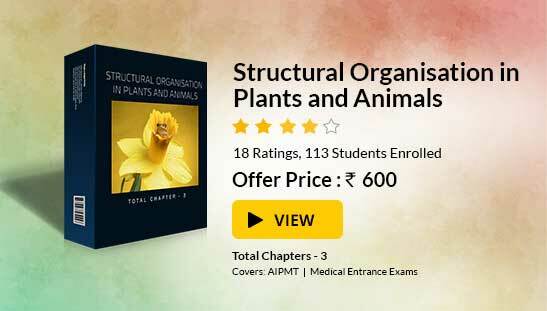 To read more, Buy study materials of Anatomy of Flowering Plants comprising study notes, revision notes, video lectures, previous year solved questions etc. Also browse for more study materials on Biology here.